How does Bluetooth work? Well… Bluetooth is the wireless technology that you can use to establish ad-hoc connection between mobile devices (cell phone, wireless mouse, laptop, wireless headset, etc) within short range by creating a wireless personal area network (PAN) in low bandwidth without any cabling. The Bluetooth technology operates in microwave radio frequency spectrum at 2.4 to 2.485 GHz. This technology is easy to set up and normally used in ad-hoc situation to transfer voice or data between mobile devices . If you need to have wireless connection between mobile devices in high bandwidth and bigger coverage range, then you need to set up a wireless network. 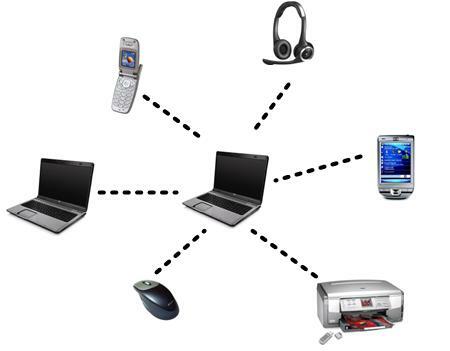 As an example, you can use Bluetooth to connect your wireless headset to laptop, connect wireless mouse to computer, connect PDA to laptop or connect cell phone to laptop. A mobile device can communicate with up to seven other mobile devices by using Bluetooth at the same time. Also Bluetooth is able to take care of both data and voice transmissions simultaneously, and this will enable users to enjoy varieties of innovative solutions such as hands free talking, printing and faxing, etc. How to use Bluetooth on computer or laptop? You need to have Bluetooth adapter to communicate with other mobile devices! Most of the new laptops have built-in Bluetooth adapter, if not you need to install an external Bluetooth adapter (Bluetooth dongle) , a small USB device that can communicate with other Bluetooth supported mobile devices. How to install the Bluetooth adapter? Just plug in the adapter to the computer’s USB port, then install driver provided by the manufacturer. Also Microsoft Windows XP Service Pack 2 (SP2) includes drivers for many Bluetooth devices, so does Windows Vista and other future new microsoft Windows, and this would install Bluetooth adapter driver automatically if it's supported. Once you have installed the driver, then it can be used to communicate to other mobile devices. Feel free to take a look on these popular Bluetooth supported devices to get more info: Bluetooth headset , Bluetooth mouse , Bluetooth keyboard , Bluetooth speakerphone . Return to top of "How Does Bluetooth Work"! !